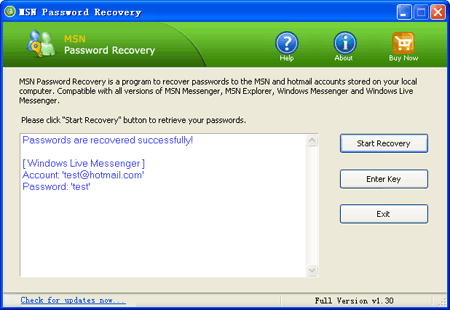 MSN Password Recovery is the MSN Messenger password finder that is used to recover lost or forgotten passwords for your MSN Messenger, Windows Live Messenger 8 and Windows Messenger accounts. It works when the "Remember my Password" or "Sign me in automatically" tickbox is checked in the messenger. One click and get your lost password back. * Recover passwords for Windows Messenger, MSN Messenger, Windows Live Messenger 8, Windows * Live Hotmail, MSN Explorer, Windows Live Messenger 9. * Recover logins and passwords for Windows Live Messenger 2011. * FREE technical support and update. MSN Password Recovery helps you to instantly recover the stored or saved password to the Hotmail and MSN Messenger account on PC. * You have an old hotmail account you'd like to get into, but you can't recall the password any longer. MSN Explorer password recovery software: Pasword Recovery. MSN Explorer Password Recovery Software easily recovers exposes msn passwords. Qweas is providing links to MSN Password Recovery 1.3 as a courtesy, and makes no representations regarding MSN Password Recovery or any other applications or any information related thereto. Any questions, complaints or claims regarding this application MSN Password Recovery 1.3 must be directed to the appropriate software vendor. You may click the publisher link of MSN Password Recovery on the top of this page to get more details about the vendor.